The 22nd Student Blogging Challenge is set to begin on March 3! This is a way for students to learn about publishing online while connecting with others around the world. The challenge runs for 10 weeks every March and October. Read more about the Student Blogging Challenge here. Registrations for classes and students will open on February 10. Sign up for email updates if you haven’t already. 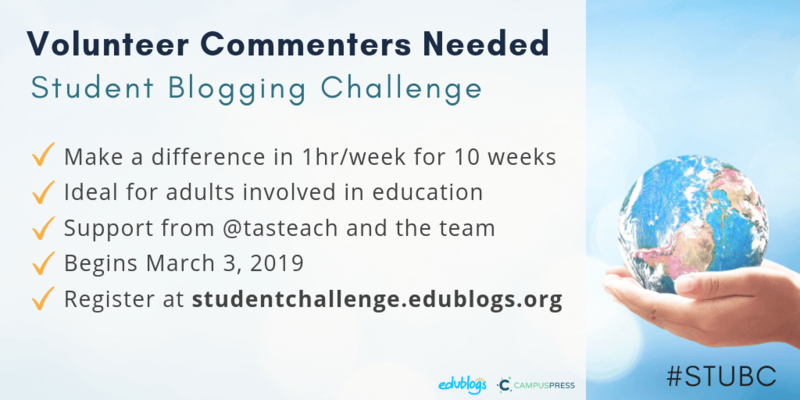 Your role will be to comment on about five student blogs each week. Note: Older students can also be commenters if they’ve participated in the Student Blogging Challenge twice or are invited by organizers. Students are welcome to get in touch if this appeals! Some students have volunteered as commenters as part of a community service project too. Here is a one minute video message to help spread the word about our call for commenters. Could you share it with your colleagues or PLN? The more commenters we can get on board, the more support our participating students will receive! Commenters need to be involved in some field of education. Before filling in the registration form below, please read the following information. Click here to save a copy of this PDF to your computer. Thank you! Just go through the following steps. Mailing List: Make sure you’ve signed up for our mailing list to get all the Student Blogging Challenge news sent to you as well as the weekly posts. Click here for the mailing list sign-up form. Form: Fill out the form below to register as a commenter. Confirmation: Our commenting team leader, Sue Wyatt, will contact you via email or Twitter to let you know if you’ve been accepted. Sue will email the commenting team with more instructions and information prior to the challenge beginning on March 3. Simply fill out the form below or click here to open it in your browser. Any questions? Leave a comment below and we’ll get back to you! Please also remember to share this post with others who you think might be able to register. Thank you! I am sorry to reach out to you this way, but I do not know any other way. I am muddling through trying to teach myself Edublogs for my students and the training shows your site. I already contacted Edublogs but I thought I would ask you too. I had my kids create Avatars. But how in the world did you get them to appear on the class blog page next to the list of students??? Thanks for any help you can give. That’s no problem, Aaron. Feel free to spread the word about the challenge with some of the schools you work with. They might like to use Global2 to take part! Thanks for posting our call for commenters on your blog too. I love the idea of the random function. That would be really fun. I’m not sure how it works!